» Marine approval to DNV, Lloyds register, GL + many more. Oil-air-coolers offer more than just compact heat exchange design and high efficiency – the cooling units and fans fitted are also optimized to ensure that the coolers run with a minimum of noise. The current range consists of 11 sizes with cooling capacities between 4.4 kW and 140 kW at 40°C inlet temperature differential, with one-pass or two-pass versions of unit sizes 5 to 60 available. Two versions in sizes 5 to 60 are available: one with low pressure drop, the other with high cooling performance. Our oil-air coolers are constructed on a modular basis, so they are suitable for both static and mobile hydraulic systems. From size ACN-10 IEC standard motors are used, so the coolers can be operated with special voltages. On request the ACN oil-air cooler from size ACN-10 are also available with a declaration of conformity according ATEX 94/9/EG. marks: CE (EX) II 2 G IIB TX or CE (EX) II 3 D TX . » Aluminium matrix ensures high cooling / size ratio. » Maximum dissipation 3.5 kW / °C. » Max. flow 600 lpm. » Three phase or single phase versions available including NEMA. » Reduced motor speeds aid low noise levels. » By-pass valve available on request. » Supplied complete with thermostat. » Compact oil-air cooler Atex certified. » Maximum dissipation 3.8 kW / °C. » Max. flow 540 lpm. » Reduced motor speeds aid low noise level output. » Stainless steel matrix versions available on request. » Compact air-oil coolers for marine applications. » Hydraulic drive for remote and mobile applications. » Max. Dissipation 3.5 kW / °C. 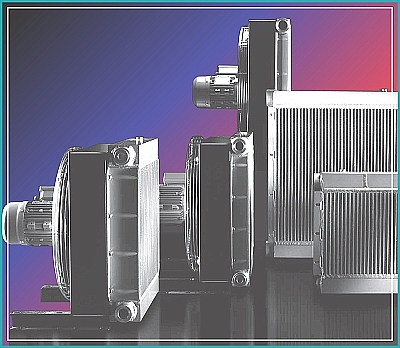 » Compact oil-air cooler for direct current applications. » Maximum dissipation 26 kW. at ΔT of 40°C. » Max. flow 150 lpm. » 12 & 24 volt available as standard. » Alternative voltages available on request. Link to view technical specification catalogue.